I was going through the explanation for Rod Cutting Problem on geeksforgeeks and there this code was mention to solve Rod Cutting Problem but i am weak in recursion and don’t know anything about DP. And i am unable to visualize what is happening there in this code in recursive part. So Please can anyone help me out please…!! Here cutRod(int price,int n) returns maximum amount obtained by cutting up the rod and selling the pieces. Let’s consider L=4 for the first sub case. 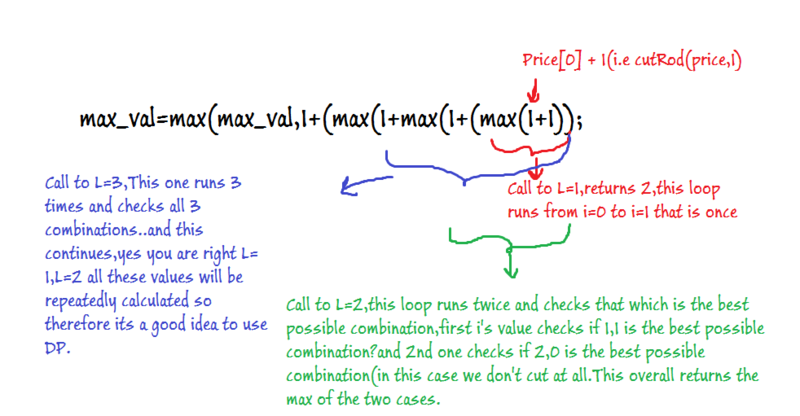 Since our condition does not match the base condition we enter the for loop. Since we passed n=4, our loop will run 4 times from i=0 to i=3. profit for a length of rod 3. Go back to the first execution. Here is a visual representation. Hope it helps now :). Sorry if I went wrong anywhere,feel free to correct me. what happens after cut-rod(p,0) returns 0? ?i understand why cut-rod(p,0) returns 0 but what will happen after that?? Thanks for that explanation ! !